Thirteen automotive manufacturing and supply companies embark on campus today and invite students to engage with them. Eighty-six percent of college students find it easier to engage with company reps in an informal and interactive environment, as opposed to a formal Career Fair. For this reason, Career Services developed CareerFEST, an interactive event series on campus that encourages students to explore industries, discover careers, ask questions and meet employers before the Fall Career Fair. Automotive Day kicks off the first of seven industry-related events in September. From 11 a.m. to 2 p.m. today (Sept. 7, 2017), in the center of campus, company reps showcase their latest innovations and technologies through live demonstrations. Oshkosh Corporation is on hand with a JLG Scissor Lift, LATV (Baja Truck), Pierce 100ft Aerial Fire Truck and a HEMTT Wrecker. A Grand Cherokee with Parallel and Perpendicular Park Assist is on display from FCA. Other display vehicles include a Ford Mustang, Ford Taurus, Audi A8 and an QSK 10 L engine. Automotive Days sponsors include: Ford, Mitsubishi Electric Automotive America, Cooper Standard, General Motors, Cummins, Continental, Oshkosh, FCA, HUSCO International, ArcelorMittal, Yanfeng Global Automotive Interiors, Nexteer Automotive and Faurecia. Representatives from the Advanced Power System Lab at Michigan Tech and additional Enterprise programs will also be on hand during the event. Last year, 68 percent of our students participated in CareerFEST events and 460 companies attended. HOUGHTON, Mich. (WLUC) – Michigan Technological University students showed off their experience at Automotive Industry Day last week. The Formula SAE Enterprise Team caught attention with their formula-style racecar. 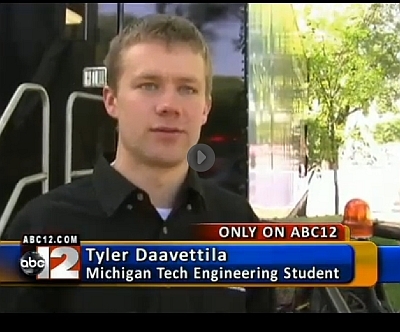 MTU seniors choose between senior design class or one of five enterprise teams. Read more at TV 6 Upper Michigan’s Source, by Mariah Powell. General Motors, a long-time supporter of Michigan Tech, will present the University with a $110,000 grant on Thursday, March 2, 2017. The campus community is invited to the check presentation at 10 a.m. in Memorial Union Ballroom A.
Steven Tomaszewski, GM’s global facilities director of operations North America and a member of Michigan Tech’s Board of Trustees, will present the check to President Glenn Mroz. 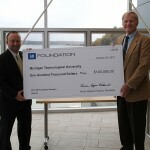 The grant will fund a variety of student activities. Among them are the Advanced Hybrid Electric Vehicle and Advanced Motorsports Enterprises, Manufacturing Engineering Initiative, pre-college STEM outreach programs and diversity programs. Original story by Industry Relations. 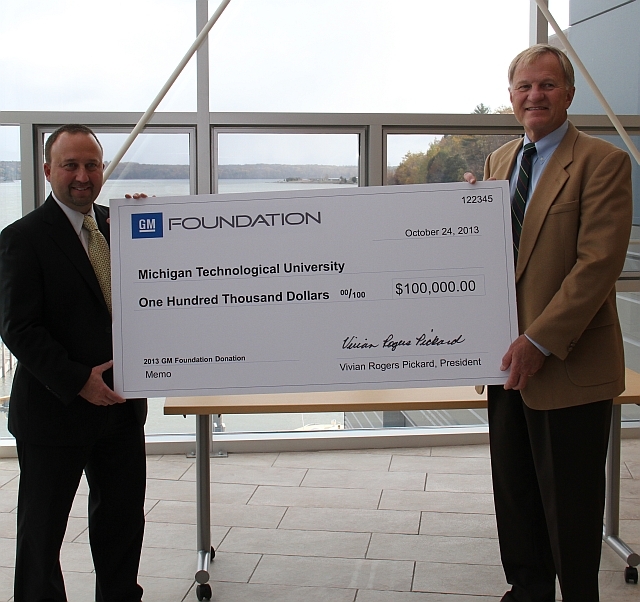 Michigan Tech and General Motors share a long-standing partnership dating back to at least 1940. Through the University/Organization Partner Program, GM annually grants $3 million to support leading universities and partnering organizations across the country. The program aims to strengthen higher education curricula in STEM and other fields important to the automotive industry, with a goal of preparing more students to graduate with related organizations, and career development resources. Read more at Tech Today, by Industry Relations. 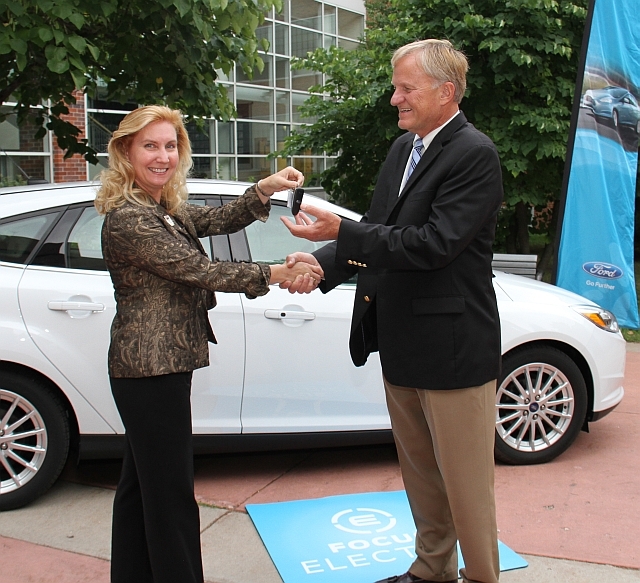 Ford Motor Company has donated a 2012 Focus all-electric vehicle to the Department of Electrical and Computer Engineering. The department is supplying the vehicle to the Hybrid Electric Vehicle Enterprise, providing students the opportunity to experience and work on state-of-the-art electric vehicle technology. Michigan Tech Engineering Programs in Washington D.C. The HEV mobile laboratory was on Capitol Hill in Washington D.C. On the labs first trip outside the state, United States Senator Carl Levin stopped by to give the students and their work a stamp of approval. “It may be located the Upper Peninsula, but all of Michigan has been impacted by it. Tens of thousands of engineers have come out of Michigan Tech,” said Sen. Levin. Michigan Tech Staff and faculty from four programs participated in the National Transportation Workforce Summit in Washington, DC, April 24 to 26. Visitors to Michigan Technological University’s hybrid electric vehicles mobile lab—on display in Washington, DC, this week— will get to fabricate and test batteries made from common household items, ride a specially designed stationary bike that turns your legs into a hybrid electric engine, and literally see a car engine run. Its cylinders are made of transparent quartz, so you can see the pistons moving up and down and the flames produced by combustion. Through MAGMA, SAE International has approved three graduate certificate programs in hybrid electric vehicles and advanced battery systems. Michigan Tech’s hybrid vehicle engineering certificate, which takes 15 graduate credits to earn, tops the list of programs approved for up to $1,800 in training grants. This is an interdisciplinary program involving faculty and staff from mechanical engineering-engineering mechanics, electrical and computer engineering, materials science and engineering and chemical engineering. Automotive engineering is entering a new era of hybrid electric-drive vehicles that demand a special set of skills most automotive engineers didn’t study when they went to college. To prepare engineers to thrive in this hybrid/electric world, Michigan Technological University is developing an interdisciplinary professional Master of Engineering program with graduate and undergraduate certification in propulsion technologies for hybrid and electric vehicles. This curriculum development is supported by a three-year, $3 million grant from the Department of Energy under the Transportation Electrification Program. Michigan Tech will preview the new professional master’s program at the North American International Auto Show in Detroit Jan. 11-24. The Michigan Tech exhibit is part of the Michigan Economic Development Corporation (MEDC) EcoXperience Showcase at the Auto Show this year. Michigan Tech’s booth will feature information about the new hybrid/electric graduate program. “We were invited because we are leading the way in professional education in hybrid electric vehicles and battery technologies,” said Carl L. Anderson, associate dean for research and graduate programs in Michigan Tech’sCollege of Engineering. Anderson and Michigan Tech engineering faculty Jeff Naber and Wayne Weaver are heading the development of the new graduate curriculum. The exhibit will be in the MEDC Alternative Energy Showcase on the lower level of the Cobo Center in downtown Detroit, home to the annual Auto Show. EcoXperience will feature a quarter-mile indoor ride-and-drive test track surrounded by landscaped and forested terrain. 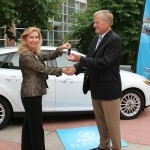 MEDC is expecting at least 50,000 of the Auto Show’s 650,000 visitors to see EcoXperience. 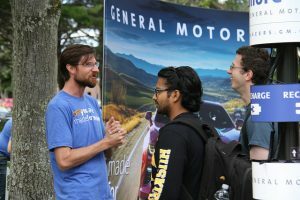 Representatives from Michigan Tech’s College of Engineering and Michigan Tech alumni who work at General Motors will staff the exhibit to answer questions about the University’s new professional Master of Engineering curriculum. The pioneering professional master’s curriculum is being developed in partnership with AVL and GM. 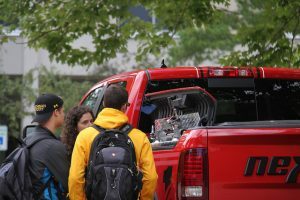 A fully outfitted mobile lab for the new curriculum is being built at Michigan Tech’s Keweenaw Research Center, and the University’s Husky Game Development Enterprise is developing computer software for student simulations in the lab. The mobile lab will also be used in outreach programs, including the US Department of Education’s GEAR UP (Gaining Early Awareness and Readiness for Undergraduate Programs) at Michigan Tech and the University’s Youth Programs, which bring hands-on engineering and science experiences to more than 1,000 middle and high-school students each year. Youth Programs and Admissions representatives will be at the Michigan Tech booth on Automotive Education day, which is Jan. 20. A press preview is scheduled for Jan. 11-12, followed by an industry preview Jan. 13-14. The Auto Show will open to the public at 9 a.m. Saturday, Jan. 16 and close at 7 p.m. Sunday, Jan. 24. Hybrid technology is a primary path for the auto industry to improve fuel economy for its vehicles, but it’s not something most automotive engineers learned in school. Michigan Technological University and industry partners are working to fix that by bringing the latest advanced propulsion and battery technology know-how to the engineers in the heartland of the auto industry—Detroit. With vehicles donated by GM, Michigan Tech has teamed up with the Engineering Society of Detroit (ESD) and industry leaders including AVL to offer the graduate-level course in Detroit. Classes and modeling studies along with hands-on labs are being taught at various facilities, including the Michigan Tech Research Institute in Ann Arbor and AVL in Plymouth. This is the second semester that Michigan Tech, ESD and industrial partners have offered the three-credit graduate course. The first course targeted approximately 60 out-of-work automotive engineers in partnership with GM. The second session has just wrapped up, and a third session will start in January 2010. The second and third courses are offered through a partnership with the Michigan Academy of Green Mobility (MAGM) and target engineers employed in the auto or transportation industry who are seeking to upgrade their skills. Approximately 100 engineers completed the fall course, and another 100 are expected to take the spring 2010 session. Tuition is paid in part through the MAGM, in partnership with the Michigan Department of Energy, Labor and Economic Growth through the Michigan Green Jobs Program. Lead instructor is Jeff Naber, associate professor of mechanical engineering-engineering mechanics and director of the Advanced Power Systems Research Center at Michigan Tech. Other faculty include Jeff Allen, John Beard, Jeff Burl, Steve Hackney, Wayne Weaver and Jeremy Worm, all from Michigan Tech. Students praise the course. “It combines theory with practical, real-world automotive knowledge, enabling engineers to significantly advance their skills in these critical areas,” said Timothy Philippart, a staff engineer with GM. “The course combines many hybrid vehicle engineering concepts to provide us with a working-level comprehensive overview that helps us effectively build on our everyday jobs,” observed Christina Cramer, another GM engineer. Downsizing, bankruptcies, factory closures . . . It’s hard to find good news in Detroit. But a new partnership aims to rewrite the headlines. It began last fall, when Terry Woychowski ’78 wanted to do something to help his fellow engineers. Dreary news reports detailed the plight of automotive workers whose jobs were disappearing in droves. What Woychowski knew, and what wasn’t being reported, was that hundreds of jobs were also being created. But these were jobs on the forefront of automotive design, and people with the skills for those jobs were in short supply. What Detroit’s laid-off auto engineers needed was to have their skill sets retooled for the twenty-first century, Woychowski thought. So he forged a partnership among three players that he knew very well: alma mater Michigan Tech; the Engineering Society of Detroit, where he is president-elect; and General Motors, where he serves as vice president of global vehicle program management. What emerged was a distance-learning version of a course in hybrid vehicle engineering. Instead of being available only on campus, Michigan Tech’s Advanced Propulsion Technologies class would also be held in southeastern Michigan. GM would provide logistical support, hybrid vehicles, and facilities. The Engineering Society of Detroit would recruit students from southern Michigan’s pool of laid-off engineers. Just in time for the spring semester, it all came together, and over sixty laid-off engineers were enrolled. Most of the students were years—even decades—out of school. So, while the tuition was free, they would all pay a steep price in sweat equity, mastering advanced math as well as sweeping new concepts in electrical and mechanical engineering and computer science. The organizers weren’t sure how many would make it. But when the course ended in June, nearly everyone who started was still standing. “It went great, better than any of us ever expected,” said the class coordinator, GM design release engineer Jennifer Goforth. Paul Blust ’85 had been away from the classroom almost twenty-five years. “It was a challenge to hop back into the academic world,” he said. “But they were very tolerant of the fact that we’d been out of school for awhile. Funny they should ask. The class’s lead teacher, Associate Professor Jeff Naber, has received two grants, one to offer another course in Detroit, another to develop a suite of distance-learning courses (see below). If something works, keep doing it. Last spring’s class for displaced auto engineers was such a success that the University is offering a similar class this fall and again in spring 2010. It will emphasize battery technologies, which are at the heart of hybrid vehicle propulsion. With support from the Engineering Society of Detroit, the class is being offered tuition-free to auto engineers under the auspices of the Michigan Academy for Green Mobility, in cooperation with the state Department of Energy, Labor and Economic Growth. The academy promotes worker training in green technologies for the auto industry. In the meantime, an interdisciplinary team of Tech faculty will be developing an entire curriculum to train engineers and technicians to design and build the next generation of hybrid electric vehicles, thanks to nearly $3 million in federal stimulus funds provided under the American Recovery and Reinvestment Act. “We’ll be training and retraining the next generation of engineers to produce vehicles that reduce fuel consumption and emissions,” said Jeff Naber, associate professor of mechanical engineering–engineering mechanics and lead faculty member on the project.